How often do you have the chance to meet a champagne winemaker? 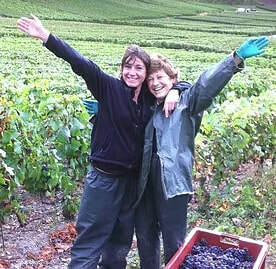 The mother-daughter team of Bernadette and Elodie Marion, owners of Champagne Marion-Bosser perpetuate a family tradition, crafting Champagnes that are the very essence of subtlety, refinement and elegance. On October 22 you'll have the pleasure of meeting Elodie Marion ad tasting the four prize-winning champagnes she makes. Elodie is from the Champagne village of Hautvillers – only 4 miles from Epernay - which is best known for its most famous inhabitant, Dom Pérignon, a Benedictine monk and cellar-master at the Hautvillers Abbey (1658-1715), who discovered how to draw out Champagne’s natural effervescence, thus turning the still vin de Champagne known as vin gris into a foamy, bubbly wine known as vin diable (devil’s wine), or vin saute-bouchon. Elodie is very much part of this tradition. The Brut Tradition, Premier Cru champagne was selected by Forbes Magazine as one of "Six Decadent Must-Have Champagnes." And Wine Enthusiast gave the wine this review: "From Hautvillers, the village where Dom Pérignon worked, this small house has produced this ripe, fruity and well-balanced wine. Some bottle age gives a taste of yeast and toasted bagels as well as fruity apples and crisp pears. The bottle is ready to drink."